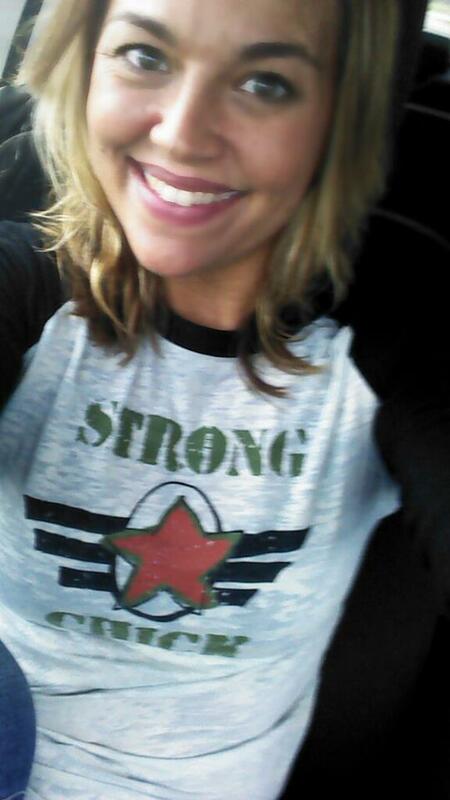 Meet Strong Chick Jenny Adamus, her story is so inspiring! She defines what Happy First is all about, following your passion…..
Hmmmm. Where do I start? Well, statistically I am a true freak of nature. I am adopted. My parents divorced when I was 7ish. My mom remarried a man that was in the Army and we ended up moving to Ft. Hood Texas all the way from Oshkosh Wisconsin. I was in 5th grade. This move to an Army base was the beginning of something much greater than I could ever understand as a kid. At seventeen years old I got pregnant with my first child, Meghan. I dropped out of high school and got my GED. I couldn’t even fit my enormous, 8 month pregnant belly in the desk. It was pretty embarrassing. I gave birth 1/3/95. While unmarried and still living with my mom and step-dad, I went to a one year vocational nursing program. I got pregnant with my 2nd kiddo Cade in 1999. I married his Daddy, a man in the Army, I met at Ft. Hood. I continued nursing as an LPN/LVN until my 3rd and final child Elisabeth was born in 2001. At this time, my husband Brian and I had moved to Oklahoma and decided it would better (and cheaper) if I stayed home with the kiddos. I loved every moment being home with my babies, but something was missing. I got depressed and extremely overweight. I started thinking hard about what my future would hold. What my dreams were. Were they still possible? Was this all there was for me? This is when I started thinking about how much I loved the military. I realized how much I loved everything that it stood for. I started talking about it frequently with my husband. Years passed and at least once a year, if not more, I would talk to Brian about this desire to be in uniform. Finally, in 2009, Brian told me basically to shut up and do something about it. He told me to find a local recruiter and find out if joining the military was even possible at my age. I was 32. I found an Air Force recruiter in Tulsa OK, enlisted in the United Air Force on November 3rd, 2009, and left for Basic Training at Lackland Air Force Base May 2010. I was 33 years old. It was the hardest thing I had ever done my entire life. I asked myself every day, for the first few weeks, “What on earth did I get myself into?” I was still overweight, completely out of shape, and miserable away from my husband and kiddos. I cried every night in private. I was in pain constantly. Yet, I reminded myself where I was and how bad I wanted it. I prayed every night, thanking God for EVERYTHING, and asking him to keep my babies safe and healthy, and for him to keep me mentally and physically together. July 2010 I graduated AF Basic Training and left for 6 more weeks for Tech school. After it was all said and done I was an Airman 1st Class in the United States Air Force National Guard. I am currently at the 138th FW in Tulsa Oklahoma. I wear my uniform with a pride that many don’t understand. Many were negative to me regarding my dream. “How could you leave your family?” or “What if you get deployed?” God, my husband, and children were 100% behind my dreams. That’s all that mattered. This November, 2012, I will have already been in 3 years. I can’t believe how fast it is going. I still thank God every time I am in my uniform. It is truly because of Him that I became who I am today. I am so glad that I decided to follow my dream. I know now that when I am a little old lady, sitting on my porch, I will have no “what ifs?” No regrets! I am so blessed.